Emma Childers and Hannah Webb (center) were each awarded a $1,000 scholarship from the Kappa Beta Chapter of Sigma Phi Gamma. The awards were presented by Pat Amlin (left) and Ann Scott (right). VANDALIA — Kappa Beta Chapter of Sigma Phi Gamma announces our 2018 Memorial Scholarship recipients. Pat Amlin and Ann Scott presented Emma Childers and Hanna Webb each a $1,000 scholarship. Hannah is attending Sinclair and Emma is going to Bowling Green. We wish all the best to both Hannah and Emma. 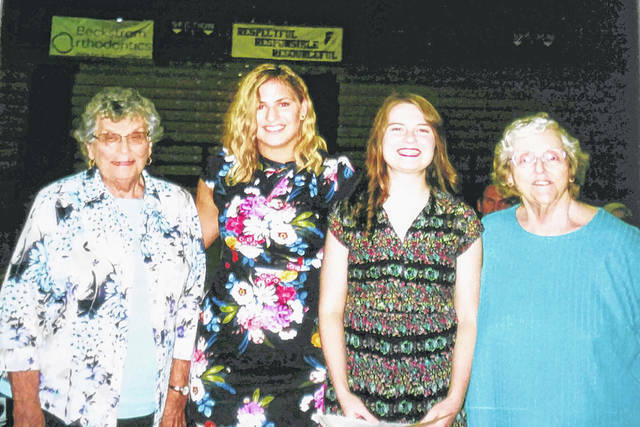 Kappa Beta awards two $1000 scholarships annually to seniors graduating from Vandalia Butler High School who are interested in pursuing a degree in education. Applications will be available again in 2019 through the high school guidance office. These scholarships are available because Kappa Beta has several fundraising events throughout the year. Our biggest event is Springtime in Vandalia an art and fine craft show. This year it will be April 27th at the Methodist Church. We also contribute to the Vandalia Food Pantry, Crayons to Classrooms, Brighter Connections Theatre for children with autism and several other charities.